Many invasive ants, including the Argentine ant Linepithema humile, form expansive supercolonies, within which intraspecific aggression is absent. The behavioral relationships among introduced Argentine ant populations at within-country or within-continent scales have been studied previously, but the behavioral relationships among intercontinental populations have not been examined. The present study investigated the levels of aggression among intercontinental Argentine ant populations by transporting live ants from Europe and California to Japan and conducting aggression tests against Japanese populations. Workers from the dominant supercolonies of Europe and California did not show aggressive behavior toward workers from the dominant supercolony of Japan, whereas they fought vigorously against workers from minor supercolonies. 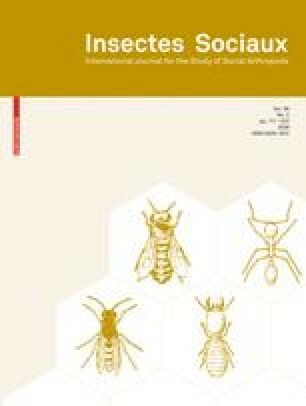 The three massive supercolonies, together with Argentine ants from Macaronesia, may be the largest non-aggressive unit formed by a social insect species in which intraspecific aggression exists. Absence or low levels of aggression at transcontinental scale, which may have derived from low genetic variation, may help introduced Argentine ants maintain expansive supercolonies. The lack of aggression implies possible frequent exchanges of individuals among the intercontinental populations mediated by human activities. We would like to thank N. Tsutsui, E. van Wilgenburg, and A. Smith for graciously providing Argentine ants from California, P. Lester, Y. Tsuneoka and two anonymous referees for helpful comments on the manuscript, J. Wetterer and A. Suarez for kind support. This work was supported by a grant from MEC-FEDER (CGL2007-64080-CO2-01/BOS) to XE, and Grant-in-Aid for JSPS Fellows (20·6386) to ES.